Highly effective communication tool for both corporate and field communications. Flexible modelling system allows for detailed simulations that conform to a schedule. Detailed animations are produced to easily show fleet productivity for draglines, truck shovel and dozer systems. Accurately validate short term mine designs and schedules – the unique 3D-Dig technology achieves this by performing a detailed simulation of the digging process for draglines, truck/shovel and bulldozer operations. Used in conjunction with Studio OP, Datamine’s complete design and scheduling package, 3D-Dig can deliver a feedback loop in the planning cycle that improves decisions and schedule compliance. This detailed modelling can greatly reduce the risk of poorly estimated mining rates or issuing excavation plans with impractical extraction sequences, meaning productivity and results are heightened. The ability to visualise a detailed mathematical model of waste dumping in 3D is a valuable tool for mitigating risk as it checks plans prior to the issue, as well as being used for reviewing and communicating with supervisors and operators. The landform reshaping module provides an exceptional toolset to rapidly and accurately estimate and plan the rehabilitation process, an area of mine planning that is often under-estimated in terms of operational complexity and budget impact. Truly a solution to all your short term mine design and schedules. The 3D-Dig automated excavation and dump sequencing system allows complex schedules to be automatically excavated and optionally dumped. Large excavations are automatically subdivided into small increments and these increments can be arranged into a Supersequence (schedule). Supersequences can be run to simulate the excavation operation, or dumps can be assigned and as each increment is excavated its volume reports to the appropriate dump. The system allows for a hierarchy of dumps so material reports to the first dump until this is full and then reports to the second etc. Once the Supersequence is set up with allocated dumps, the process can be simulated. Dump constraints can be subsequently changed and simulation re-run producing a different dumping scenario. In this manner the user can rapidly investigate a variety of dumping options. Common dumping problems such as premature filling of allocated dumps and unplanned long and high hauls can be rapidly identified and more optimal solutions found. 3D-Dig’s truck and shovel simulation system builds on the automated excavation and dump sequencing. It has a sophisticated modelling system which accounts for truck dynamics, haul routes, loader productivity, equipment availability and planned downtime. For each incremental excavation and dump in the sequence, the exact haul route is determined which connects fill points and dump points. The system allows for multiple fleets operating in parallel and as simulation progresses, parallel operations are simulated and displayed. At the end of the simulation, an extensive reporting system details productivity and volume information can be generated. The post mining topography can be reshaped in a manner that conforms to design slope criteria, balances cut and fill and minimises transport distance. This module includes a Transportation Analysis which models incremental movement of parcels of material from cut to fill and produces a set of transport vectors indicating the required spoil movement. The dragline simulation system allows both detailed and approximate modelling of dragline operations. Each major dig step is modelled in a manner that conforms to the limitations of the dragline geometry. For each step, excavation and dumping progresses incrementally and the system constantly checks dig depth and dump height limits. The system optionally calculates productivity based on machine geometry, motor characteristics, and detailed simulation of bucket trajectories during the operation. 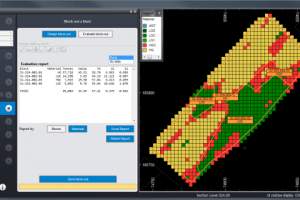 Detailed simulation progresses with the user positioning the dragline at each dig location. Approximate simulation, suitable in steady-state areas of the pit, progresses with multiple blocks excavated and dumped simultaneously. On completion an animation is created detailing the operation. The bulldozer simulation works with a starting topography (blast profile, survey pickup etc) and a target topography (design topography representing completion of operation). The bulldozer model includes machine geometry, weights and speed-rimpull curves. The system simulates a large range of options for excavating and transporting material using specified bulldozers and an optimum method is identified. On completion the system produces detailed productivity information, a full animation of the operation, and a set of intermediate surfaces which can be used to guide the bulldozer fleet. The system also identifies optimal blade loads for various stages of the operation. This module rapidly simulates multiple strips of dragline operation producing a pre-strip horizon and spoil profile for each strip. Other functions allow the rapid design of spoil dumps to accommodate pre-strip material and in conjunction with other modules the life of pit can be modelled incrementally block by block and strip by strip.